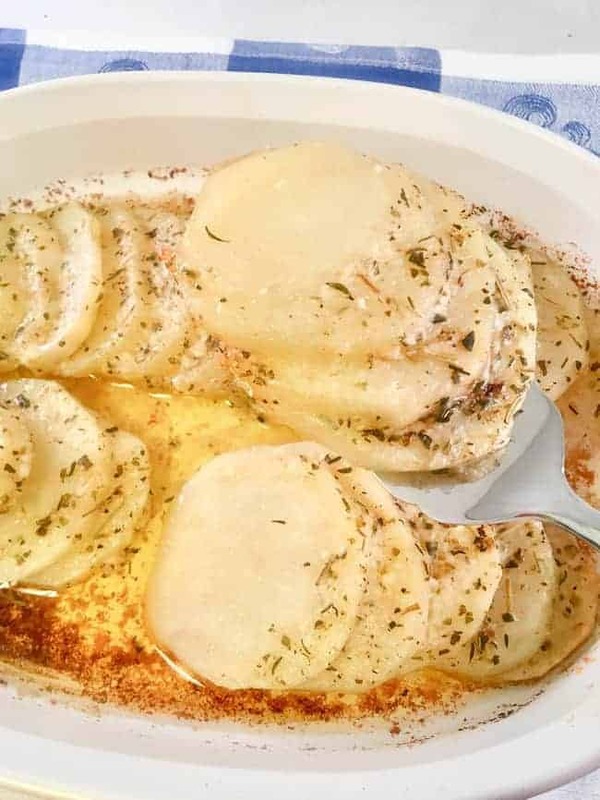 This potato side dish is so easy and you probably already have the ingredients on hand. While roasted potatoes is very popular now, this recipe is a classic. Slicing the potatoes and baking them in the oven, covered with foil, is an old time favorite method that will never go out of style. This is the way I remember eating potatoes as a kid. Potatoes can be served with just about anything. A perfect side dish for pork chops, baked chicken, or meatloaf! This recipe calls for Herbes de Provence. It’s a mixture of dried herbs and most often contains rosemary, oregano, thyme, savory, and marjoram. It adds a delicious flavor to all types of meats and vegetables. Herbes de Provence also adds a delicious aroma to your home during baking! 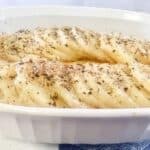 According to Culinarylore.com, Julia Child brought the term herbes de provence to the American vocabulary. Read their article here: https://culinarylore.com/cooking-terms:what-is-herbes-de-provence/. Use a mandolin, like this one by OXO, to slice the potatoes evenly. I like using a mandolin because it’s faster and safer. You can peel the potatoes first but leave the skin on if you prefer. Also, use the microwave to melt the butter then spoon over the sliced potatoes that you’ve placed in a casserole dish. Then add the seasoning, cheese, foil cover, and bake at 400 for about 40 minutes. If you try this recipe, let me know how it turns out. I’d love to hear from you. Keep in touch! Preheat oven to 400F. Peel the potatoes, if desired. Thinly slice and place into a casserole dish. I like to "fan" the slices, like you would a deck of cards. Melt the butter in the microwave. I use the whole stick of butter because, well, I love butter. You can use 1/2 stick of butter if that suits you better. Then drizzle the melted butter over the sliced potatoes. Sprinkle the Herbes de Provence over the potatoes. Add salt and pepper. Then sprinkle 2 tablespoons of the parmesan cheese on top. Cover tightly with foil and bake for 40 minutes. Remove the potatoes from the oven and remove the foil. 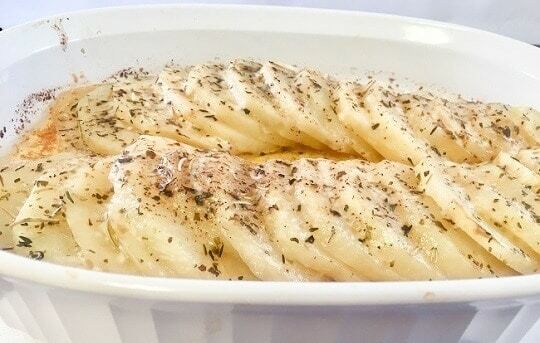 Sprinkle the remaining parmesan cheese on top of the potatoes and bake uncovered for an additional 5-10 minutes or until the cheese is melted. Need a great dessert recipe? You won’t be disappointed with these treasures! Here are some Main Dish recipes you may like.